Art during the season of Advent is more often to reflect the characters central to the season. The Holy Child, the Blessed Virgin, the humble Joseph and the distant shepherds. 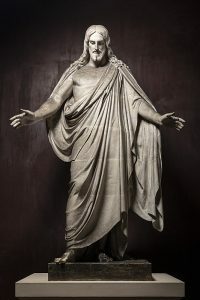 An honest Advent theology will ask; ‘What kind of Christ does our world now need?” I am drawn to the statue of Christ by Thorvaldsen, a focal point in the Protestant Cathedral in Copenhagen, Denmark. The innocence depicted by the artist is not that of the infant but rather that of the full grown, mature Christ. I have heard it said that the artist never intended the statue to be as it is. When the work was completed, the Christ stood victorious. Arms lifted high and head held in victory. A Christ in control. With the work completed, Thorvaldsen left his studio for well deserved rest. Little did he know that upon returning, he would see his statue of Christ altered by several days of dampness. Now the head of Christ was bowed and his arms outstretched with hands low. Thorvaldsen’s altered Christ was not embraced by the artist. This was a different Christ than what he intended to convey. Only through the eyes of a friend did Thorvaldsen finally come to terms with an altered theology which presents the Christ more of humble incarnation. While reading of Thorvaldsen’s masterpiece I am also thinking of an individual who evacuated their home at Wrightsville Beach being informed that the eye of Florence was headed their way. The fall storm season has reshaped much of eastern North Carolina. Recovery work is slow. People grow impatient with promises made. There is conversation of another storm headed their way from the south. The evening news reports the damage of Florence to be even more significant inland as streams overflow their banks, rivers crest at record levels and the press reports lives lost. One mother tried to drive through a barricaded road due to flood waters. The car stalled, she tried to flee the car with her infant only to lose grasp of her child. She survives. The drowned child is later located under the vehicle. There are no tears of stone from Thorvaldsen’s Christ. Just hands. Large hands reaching down to rescue.